. . . The diner, after all, is at once the result of New York’s loneliness and its solution. It’s a place where social rules among strangers – no eye contact, no smiling, especially no conversation – are suspended. The greatest diners, like Chelsea Square, are the 24-hour ones that cater to morning workers and midnight drunks, and to the people who find themselves in those sunrise spaces in between. Yeah, it’s something of a clichéd piece, characterizing the NYC diner as a refuge for loners and eccentrics in a sort of romanticized, 1940s kind of way. 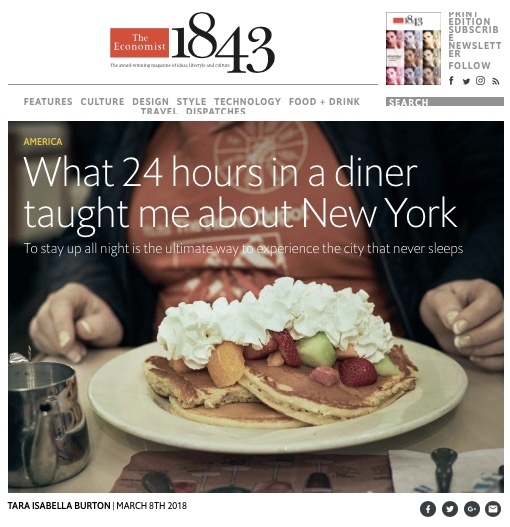 Nevertheless, I enjoyed reading it, because it pushes my nostalgia buttons: The 24-hour diner ranks high among the institutions I miss most about living in New York City, where I lived from 1982 to 1994. During that time, two such places were regular stops for me, the Washington Square Diner on West 4th Street and 6th Avenue, and the Cozy Soup ‘n’ Burger on Broadway and Astor Place. It’s no accident that both are in the heart of Greenwich Village, near the buildings of New York University, where I went to law school. 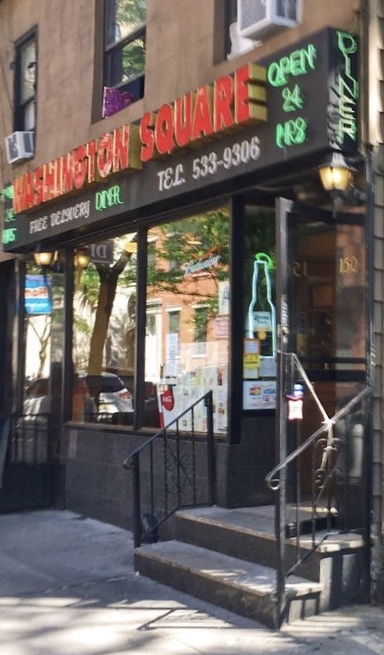 The Washington Square Diner was a short walk from Hayden Hall, then the primary dorm for first-year law students. 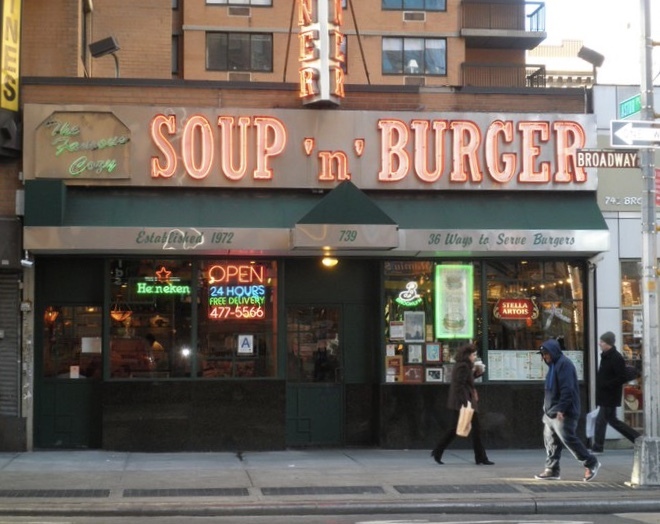 The Cozy Soup ‘n’ Burger was close to the Mercer Street residence hall, where most second and third year law students lived. When I visit New York, a meal at the Cozy is a required pilgrimage. I usually order the same thing: A cup of their incredible split pea soup with croutons and a delicious turkey burger. Some of the same guys who worked behind the counter in the 1980s are still there. I also make occasional visits to the Washington Square Diner, where their challah bread french toast remains one of my favorites. For most of my life I have been a night owl type. Coming from northwest Indiana, the 24-hour city diner was a revelation to me. Good, basic comfort food at decent prices, available around the clock. Awesome! I’ve been in Boston for some 24 years. While NYC is the city that never sleeps, Boston tends to go to bed early. Although there are many things I like about Boston, how wonderful it would be to see a bunch of 24-hour diners pop up. After all, sometimes a burger or plate of eggs at 2 a.m. just hits the spot. Bob, if a 24-hour diner was that close to me, I would probably try to do a partial direct deposit of my paycheck!!! I wrote a good bit of my doctoral dissertation in a 24 hour diner in State College, PA–not quite the same as NYC, but an important part of the life of the town! Kerry, here’s to Penn State area diners and the PhDs they help to produce! When I was a kid my favorite hamburger joint/diner was Schoop’s. Brad, I loved Schoop’s while growing up in the Region! The burgers were huge, and I loved the Green River pop. It was a favorite destination for my high school friends and me.